On the heels of my last blog post suggesting that impact investing can improve financial literacy, I write this week about Impact Shares being named the Most Innovative Issuer of the Year by ETF.com. For anyone new to this site and investing generally, I recommend you review my earlier blog post explaining ETF’s. Impact investing can increase the financial literacy of the “uninterested” simply by virtue of the fact it is an interesting! Most of us are increasingly conscious about the Environmental, Social and Governance (ESG) factors surrounding society so what better way to get engaged then to learn about companies making a difference in these areas. Most investing and financial material is tedious and doesn’t appeal to women but impact investing can provide a compelling reason to learn more about both investing and challenges facing the world. NACP: “NACP tracks the Morningstar Minority Empowerment Index, which is designed to provide exposure to US companies with strong racial and ethnic diversity policies in place, empowering employees irrespective of their race or nationality.” Donated advisory fees go to the NAACP. WOMN: “WOMN tracks the Morningstar Women’s Empowerment Index, which is designed to provide exposure to companies worldwide with strong policies and practices in support of women’s empowerment and gender equality.” Donated advisory fees go to the YWCA. SDGA: “SDGA tracks the Morningstar® Societal Development Index, which is designed to provide exposure to companies worldwide with strong policies and practices relative to the United Nations Sustainable Development Goals (SDGs) that are actively engaged in the world’s poorest countries known also as the 47 Least Developed Countries (LDCs).” Donated advisory fees go to the UNCDF last mile financing vehicle. You can see a complete listing of the individual stock holdings in each ETF by visiting Impact Shares. You can also learn more about each ETF including its risk profile, fees and all other information on the site as well. 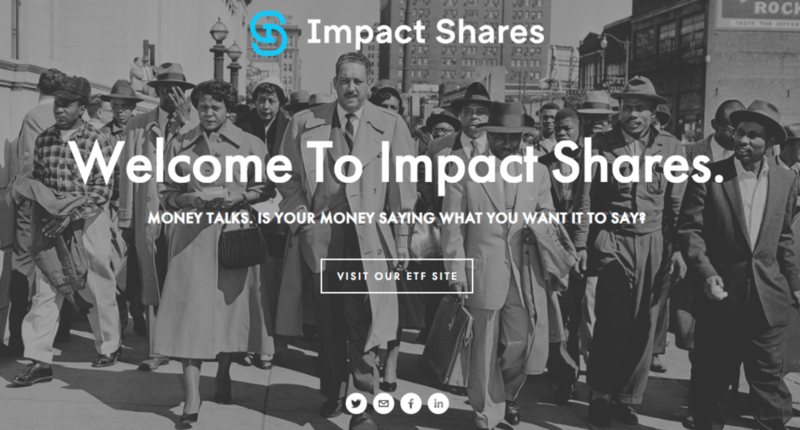 Impact Shares is somewhat unique in the ESG ETF world as it works directly with the social cause to learn about what issues are important and to build a company screening tool in that manner. I am interested to see what other ETF offerings may come from Impact Shares in the future.